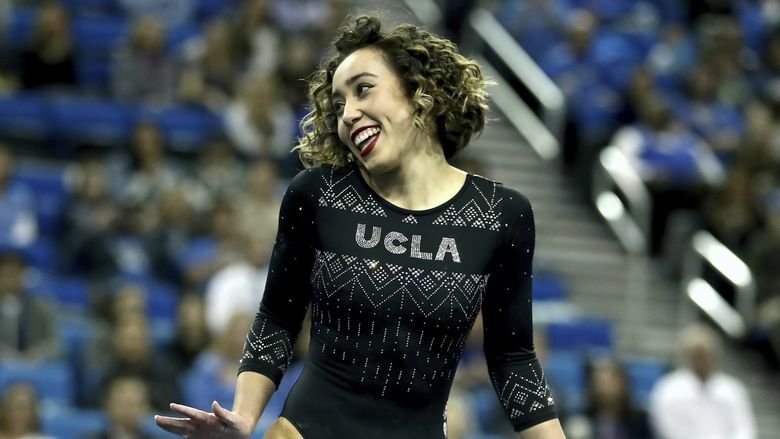 Not so long ago, gymnastics left UCLA's Katelyn Ohashi broken. So how did the Newcastle native rediscover what she loved about the sport and find a voice to influence others? Katelyn Ohashi’s smile is more important than the score. On Jan. 12, both were perfect. In a bedazzled blue leotard, on a worn blue mat, the Newcastle native shimmied and shined. She vaulted through the air like an ax somersaulting toward its target. She swung her arms and flipped her hips, dancing to the music as her teammates mimicked her every move. She clapped along to “The Jackson Five,” snapping her fingers before turning to fly. She whipped her curly brown hair and stuck out her tongue; she contorted and careened and spun and smiled. That smile? Not so much. At the Collegiate Challenge inside the Anaheim Convention Center Arena, Ohashi earned a perfect 10 for her jarringly joyful floor routine. The 21-year-old UCLA gymnast added to an already extensive athletic resume. She hugged and high-fived her teammates as the crowd erupted in a standing ovation. In less than two minutes on the mat, she transcended gymnastics. Her smile jumped right out of the gym. Maybe that’s why Ohashi’s perfect floor routine has been viewed more than 113 million times and counting on Twitter, Facebook and YouTube, as of Thursday afternoon. Maybe it’s why Good Morning America flew the family from Los Angeles to New York for an appearance on national television. Maybe it’s why a senior gender studies major at UCLA has suddenly evolved into a role model for the next generation of gymnasts. In a sport waylaid by the Larry Nassar sexual abuse scandal, Ohashi somehow managed to infuse a little fun. “In the Olympics the culture is so different,” Katelyn Ohashi said. “You have young girls that haven’t completely stepped into themselves, and have been coached and taught to be one way, which is the cookie-cutter gymnastics (mentality). You have to be serious in order to be successful. It’s all these things we’re told at that age. The routine was plenty refreshing … and the aftermath was overwhelming. Katelyn is the baby of the family, the youngest of four Ohashi kids and the only girl in the group. And on Monday morning after the event, Diana and Richard Ohashi’s baby girl was driving her parents to the airport when they abruptly decided to turn around. When your baby becomes an overnight viral sensation, work probably has to wait. Richard’s boss obliged. In the weeks since, the whirlwind hasn’t subsided. More than 10,000 fans attended UCLA’s first meet after the suddenly famous floor routine. The defending NCAA champion Bruin gymnasts have won five consecutive events. Ohashi returned Sunday to her home state for a meet at the University of Washington, where she performed the routine again, dazzling a record crowd of 7,228 at Alaska Airlines Arena, including friends and family. She strutted. She smiled. And once again, scored a perfect 10. Katelyn Ohashi is enjoying gymnastics, which isn’t something she could always say. Technically, Ohashi has not been a gymnast since birth. It actually started even earlier. “My whole pregnancy I’m like, ‘This kid’s doing cartwheels,’ ” Diana Ohashi said. “Then she used to play under the kitchen table, in a headstand, with her knees up against the table. She used to climb up the door jambs. 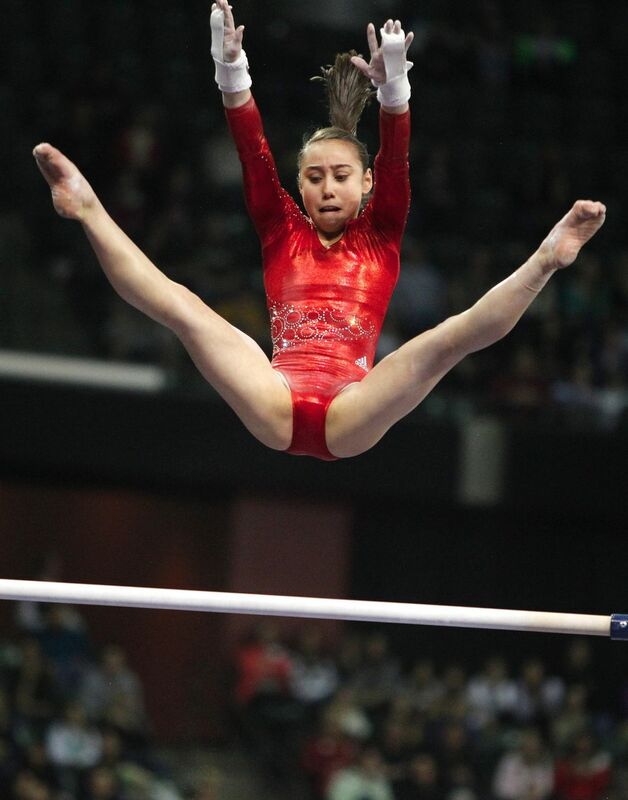 As a child, Katelyn Ohashi would do handstands under the kitchen table (photo courtesy Diana Ohashi). 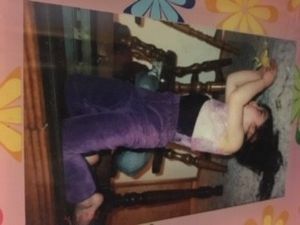 At three years old, Katelyn traded in Diana’s couch for more legitimate equipment. At nine, she moved to Missouri (then later, Texas) to further pursue the sport. She spent four years on the United States national team, even topping future four-time Olympic champion Simone Biles to win the 2013 AT&T American Cup. She was winning, but she was hurting. She certainly wasn’t smiling. Katelyn competed with a fractured back and two torn shoulders. She struggled to feel comfortable in her body, later writing that she was once compared to “a bird that was too fat to lift itself off the ground.” She worked out late at night until she felt skinny enough to sleep. Ohashi was also diagnosed with a rare skin disease called granuloma annulare, which left unsightly bumps and discolored circles on her skin. She suffers from ulcerative colitis, a chronic bowel disease that causes long-lasting inflammation and ulcers in the digestive tract. In Katelyn’s case, it manifests itself with vomiting, sharp stomach pain, uncontrollable bowel movements and bleeding. So in 2015, she traded Olympic dreams for a college campus. She dropped elite gymnastics and enrolled at UCLA. She let go of the pressure. Katelyn Ohashi cut out the parasite and pursued her passion anew. “My entire college career has kind of been me stepping into my joy,” Katelyn said. “I wouldn’t say that this moment or this viral stuff has defined me or made me a happier person. Want to see a joy so pure it threatens to shake the gym? That’s easy enough; it radiates throughout the entire floor routine that ripped a hole in social media. It was also on display in Seattle on Sunday. It’s hard to imagine that Katelyn’s smile could actually get any bigger. The fierce 4-foot-10 gymnast has continued to transcend her sport, spreading a message of inclusiveness and body health on various talk shows and in interviews. Several years ago, she started a blog to share her own experiences and allow her voice to influence others. “Writing and putting that stuff out there has really given me the courage to really be who I am and be comfortable in my skin,” Katelyn said. “I was just on a panel the other night about body image and eating disorders. Turns out, Katelyn Ohashi is so much more than a viral sensation. She’s more than a gymnast, than a perfect score and smile. “I just feel blessed that she’s so confident, and she’s got an idea of what she wants to do,” Diana Ohashi said. “When she was in school she was Joan of Arc. I kind of think about her that way sometimes. It was really cute. I dressed her all up and she did a play at church. I just feel like she’s a crusader.